Fallboard Lock is rated 4.18 out of 5 based on 52 ratings. 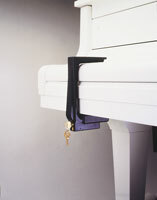 This simple, yet well-designed lock clamps down on the fallboard making it impossible to open and play the piano. Extremely lightweight, yet virtually unbreakable. 5.75" opening (can be adjusted smaller) fits almost every piano. Foam rubber-lined, Will not damage the piano's finish. Locking mechanism made by Master Lock for added security. Perfect for any church, restaurant, home with children, hotel, etc. Two Keys, so you can keep one and lend one. Keys can be special ordered just in case you lose one.